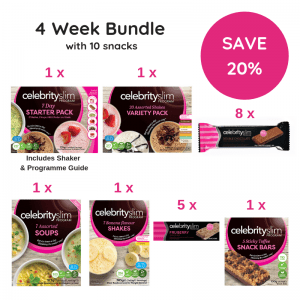 The Celebrity Slim Starter Pack contains everything you need for the first week – including a selection of shakes and soups in a range of flavours, a high-quality shaker to give you the frothiest shakes every time, and a Celebrity Slim Programme Guide. SHAKES: As a meal replacement, put 200-250ml of cold water into a Celebrity Slim Shaker. 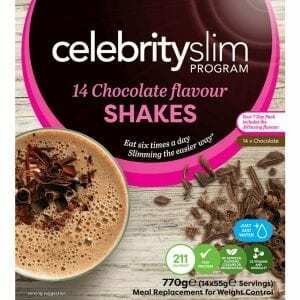 Add contents of sachet and shake vigorously for 30 seconds. It is important to maintain an adequate daily fluid intake when using this product. It is important to follow these directions. SOUPS: As a meal replacement, put 200-250ml of boiling water into a mug. Add contents of sachet and stir well. Always take caution when using hot liquids. It is important to maintain an adequate daily fluid intake when using this product. It is important to follow these directions. DO NOT POUR BOILING WATER INTO THE SHAKER. 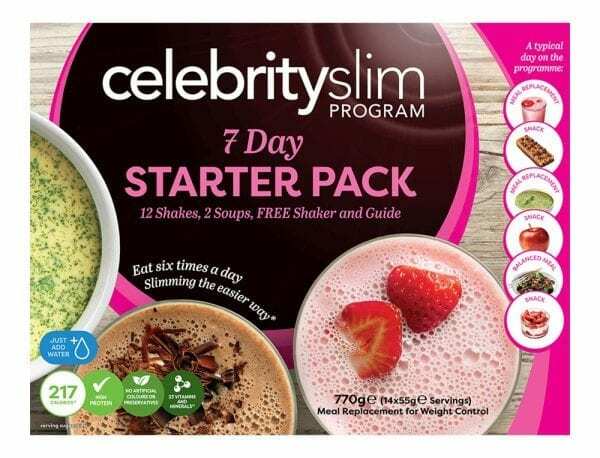 PROGRAMME GUIDE: Our comprehensive Programme Guide contains all of the information and support you need to achieve your goals – detailed programme guidance and information, hints and tips to help answer your questions, delicious recipes and a section where you can record your personal progress. Skim Milk Powder, Vegetable Oils (Milk) (Sunflower Oil, Refined Palm Oil), Glucose Syrup Solids (Gluten), Calcium Caseinate (Milk), Whey Protein Concentrate (Milk, Soya), Soya Protein Isolate, Modified Maize Starch, Dietary Fibre (Fibersol-2™), Minerals (Dairy Calcium (Milk), Magnesium Oxide, Ferric Pyrophosphate, Zinc Sulphate, Manganese Sulphate, Copper Sulphate, Potassium Iodide, Sodium Molybdate, Chromium Chloride, Sodium Selenite), Thickeners (E412, E415), Gelling Agent (E508), Inulin, Black Pepper, Emulsifiers (Lecithin, E450, E471, E472c), Vitamins (A, Thiamin, Riboflavin, B6, B12, C, D, E, K, Folate, Niacin, Pantothenic Acid, Biotin), Anti Caking Agent (E551), Maize Starch, Potato Starch, Parsley, Celery, Potassium Chloride. GARDEN VEGETABLE FLAVOUR SOUP: Vegetable Flavours (9%) (Wheat, Soya, Celery) (Hydrolysed Vegetable Protein, Yeast Extract, Vegetable Extract, Salt, Sugar, Spice Extract, Mushroom Flavour, Herbs, Dehydrated Vegetables (Onion, Cabbage, Garlic, Spinach, Carrot, Vegetable Oil (Canola)), Vegetable Powder (3%) (Tomato Powder, Onion Powder, Garlic Powder, Pumpkin Powder, Corn), Carrots, Leeks, Chive Flakes, Cumin, Flavour Enhancers (E621, E627, E631), Food Acid (E262), Colour (E160a).